As supplies last, this book will be given freely without charge to individuals who would like to read it. 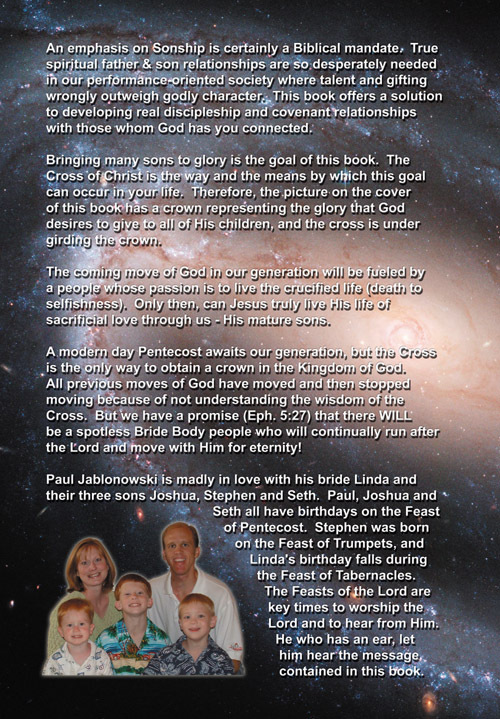 However, to actually live the Cross of Christ as discussed in this book will cost you everything. Most Bible quotations in this book are taken from the New King James Version Copyright © 1982 by Thomas Nelson, Inc. The Hebrews 2:10 verse quoted on this page is a combination of two translations: 1) the Complete Jewish Bible translation © 1998 Jewish New Testament Publications, Inc.; Jerusalem, Israel; and 2) the New International Version. Copyright © 1978 by International Bible Society. A special "thank you" to those who spent of their own free time to help edit and proofread this manuscript: Louise Switzer from Kansas, Carolyn Boyette from Alabama, Fran Beauchamps from New York. And last, but certainly not least, my beautiful bride Linda Jablonowski who made the final refining of the manuscript before being delivered to the printer. Each of these editors made excellent comments and suggestions that helped these writings to become a book. Finally, and most importantly, thank you Jesus for entrusting me with the revelation contained in the pages of this book. You really do reveal Your secrets to the lowly and scatter the proud in the imagination of their hearts (Luke 1:46-55). It has been a true joy to walk and talk with You along the path of life. I hope and pray that this knowledge will be stewarded in Your perfect timing and wisdom. Let Your Kingdom come and Your will be done on earth as it is in heaven! Introduction - A New Day! Chapter 1 - My Story - A personal testimony of how God changed my life in college, and what He is doing with me today. Chapter 2 - To Worship God in Spirit and Truth - Answering the age-old question of "who am I?" and how your spirit must be reborn to see the kingdom of God. Chapter 3 - Father Leadership - People need real hands-on father examples and not corporate institutional leadership. Chapter 4 - Spiritual Authority vs. Civil Authority - A teaching to combat the false spiritual authority of the "Nicolaitan doctrine" or the clergy vs. laity system. Chapter 5 - Covenant of Peace: The Millennial Age - A Scriptural study of this biblical Covenant which defines the new age we currently find ourselves transitioning into. Chapter 6 - The Lord's Tithe and Finances - Should all Christians give 10% of their income? If so, who should get it? Chapter 7 - Millennial Temple Model - Study and Photos of an actual scale model the author created based on the details given in Ezekiel's vision of a temple which has never yet been built (described in Ezekiel chapters 40-48). Chapter 8 - The Passion Movie - An apostolic message of the good and the bad in Mel Gibson's movie: The Passion of the Christ. Chapter 9 - The Wonder of September 11th - A look at the prophetic implications of 9/11 for both good and evil. Chapter 10 -A Sign of God Birthing the Apostolic - How the stars in heaven are lining up to fulfill prophecy in Revelation chapter 12. Chapter 11 - Birth of a Manchild Poem - Written on the day my son Stephen was born on September 11th 1999. Chapter 12 - Modern Day Apostles - How to recognize true apostles, and what is a marketplace apostle? Chapter 13 - Are There Woman Apostles Today? - A look at the role of women in the equipping ministry of apostle. 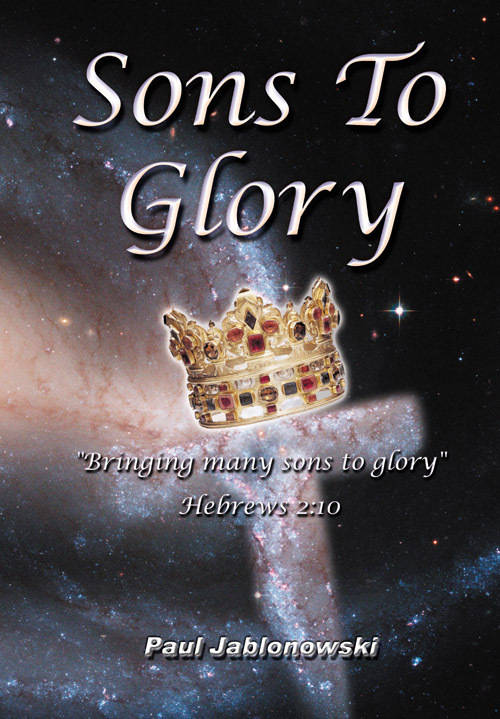 Chapter 14 - The Birthing of Zion's Sons - A study of the second coming of Jesus through spiritual birth. Chapter 15 - Spiritual Map for Huntsville Alabama - A look at the accomplishments of Huntsville's spiritual leaders in the past in order to see God's destiny for our city today. Chapter 16 - The Calling of Huntsville Alabama - The past, present, and future of my city. Chapter 17 - Alabama Blesses Israel - A report on the Alabama Government resolutions in 2002 to support Israel and the "Christ Our Passover" celebrations here in Huntsville Alabama. Chapter 18 - Alabama Ten Commandments Monument - Prayer, and prophetic implications surrounding the Judge Roy Moore stand in Montgomery Alabama for righteousness in our court systems. Chapter 19 - "The Call" Kansas City - Intercession for Americaat a youth gathering to fast and pray for revival in our nation. Chapter 20 - The Shot Heard Around the World on 07/07/07 - A 300 man Gideon's army blowing shofars at The Call in Nashville while praying and fasting for revival and spiritual revolution. Chapter 21 - Highway of Holiness Intercession for the Nations - An ordained time of musical prayer for Africa and Israel. Chapter 22 - The Bride of Christ - Three times of intercession and spiritual travail for the Bride of Christ to come forth in the earth.